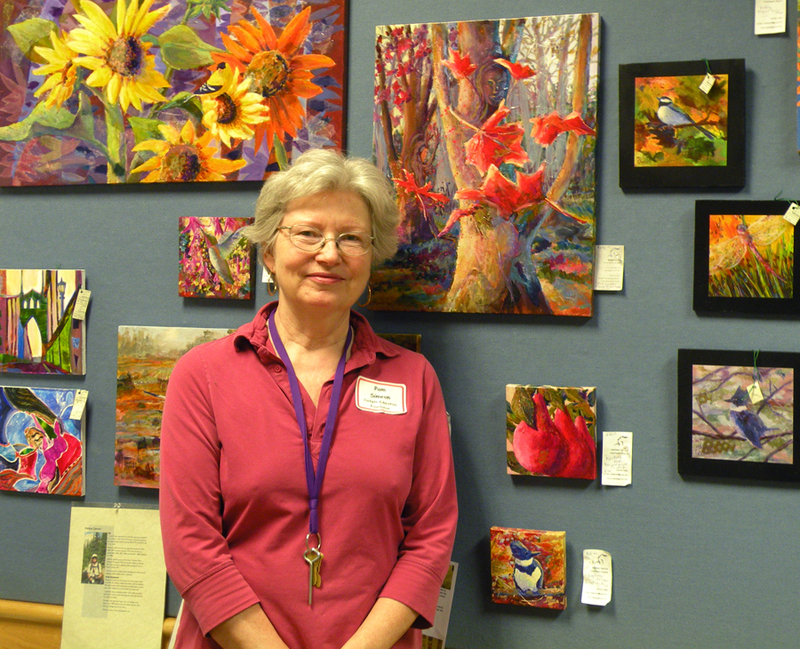 Coming Up ~ Fall Art Shows! Flying by the seat of my pants to catch up, I stayed outside too long with my camera. 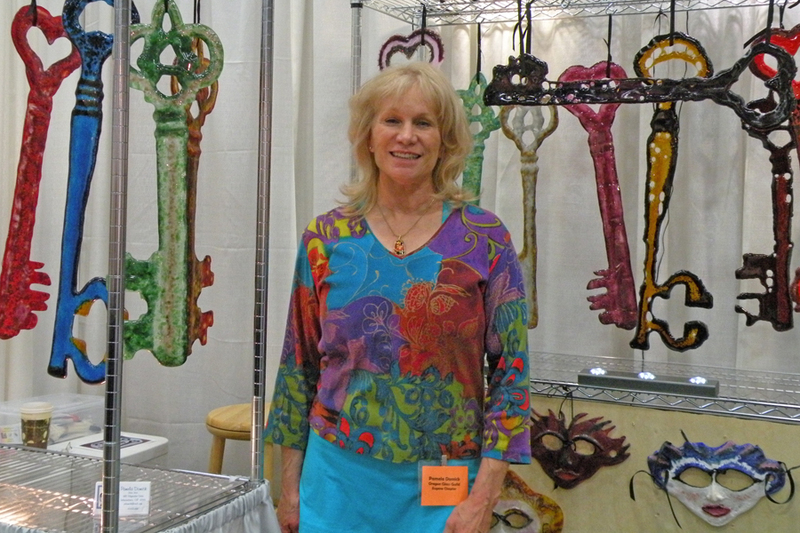 Now I’m buried in my studio working as fast as I can producing new art glass home decor, jewelry and garden art for upcoming fall shows. The first is our first – the inaugural White Salmon Fall Art Tour takes place on Friday, Saturday and Sunday, October 24, 25, 26 from 11am until 5pm. Downtown White Salmon. One week from today! We have an event page on Facebook with our map and more information. A White Salmon Art Council sponsored event. Join 14 White Salmon artists as they open their studios and a Pop-Up Gallery all within walking distance of downtown White Salmon for a Fall Art Tour. The self-guided tour takes place on Friday, Saturday and Sunday, Oct 24, 25 & 26 from 11:00 am until 5:00 pm all three days. 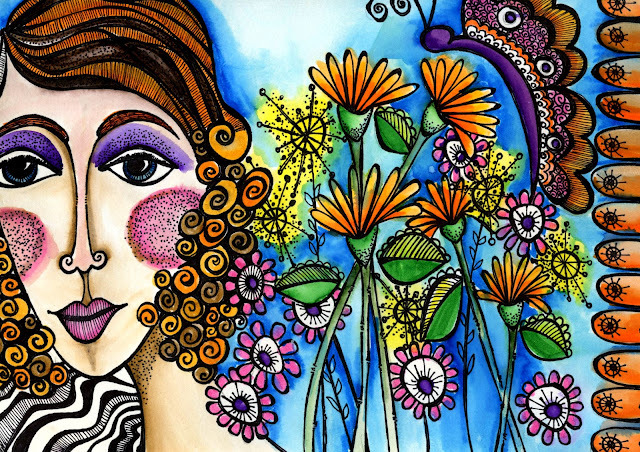 A preview and month-long viewing of the artists work is at the White Salmon Pop-Up Window. Cyndi Strid, mixed media artist, is excited to share large-scale drawings and her admiration for our native Northwest bees in studio #4. Miki Caldwell is a functional potter who enjoys making tableware and outdoor decorative ceramics in her studio in Husum, WA. Ellen Nippollt creates shelter, furniture, clothing, and increasingly, jewelry, designed to a new materialism that’s torn from place, re-paired, re-strung. 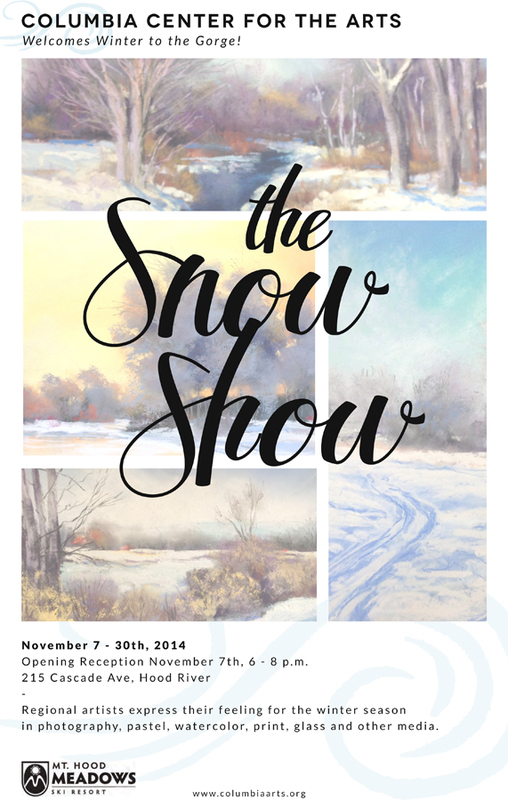 Opening the First Friday in November, I’m producing work in my other kiln for…..
… a gallery show titled ‘Snow’ at Columbia Center for the Arts. It opens the First Friday in November with a reception from 6 until 8pm and runs through the end of the month. I’ve created a series of ‘Snow’ Bowls in my ‘Celestial Series’ tradition and will offer my iridescent art glass snowflakes. Between those two events I’m delivering work to the NEW Holiday Pop-Up Shop in Hood River at 301 Oak, formerly Gallery 301! “Locally handmade gifts for everyone on your shopping list.” It is open Fridays and weekends November – December and open every day the week before Christmas from 10am until 6pm. There’s more in November, but for now I am dashing madly toward my studio! Hope you’re all having a wonderful fall. 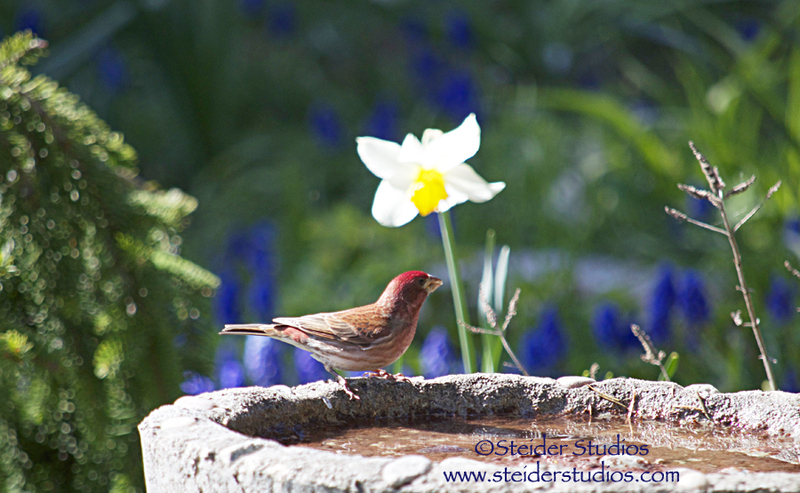 You can see many photographs I’ve taken between my last post and this one on my Facebook Page, Steider Studios. 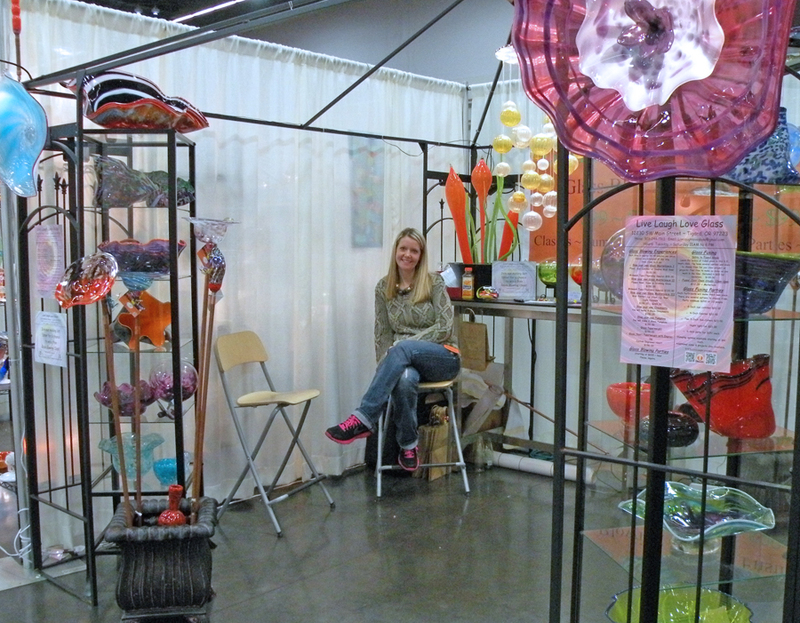 My car is packed and I’m ready to set up my booth today for Oregon Glass Guild’s Glass Gallery this weekend. 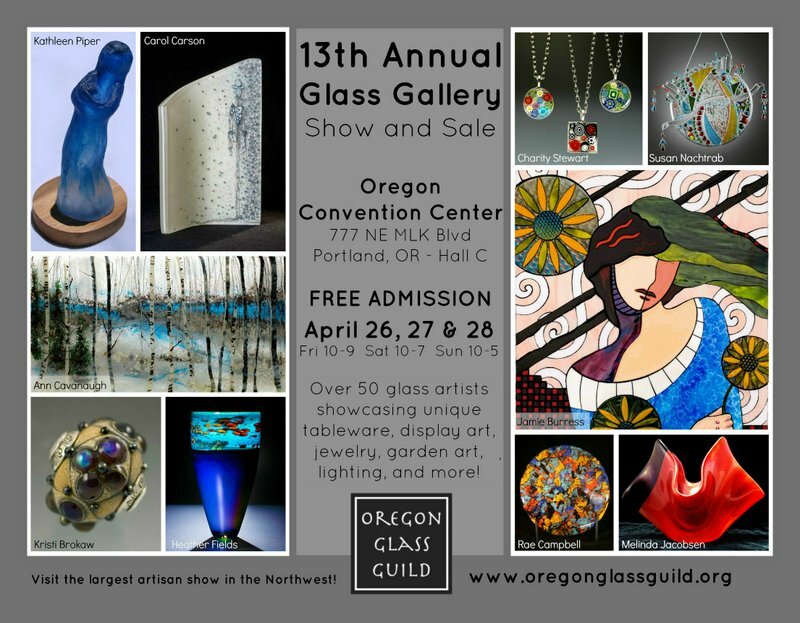 Held in conjunction with Gathering of the Guilds at Oregon Convention Center, Portland Oregon April 26, 27, 28 it’s the largest artist run art show west of the Rockies. It takes me almost a full day to set up my booth for a three-day show like this. 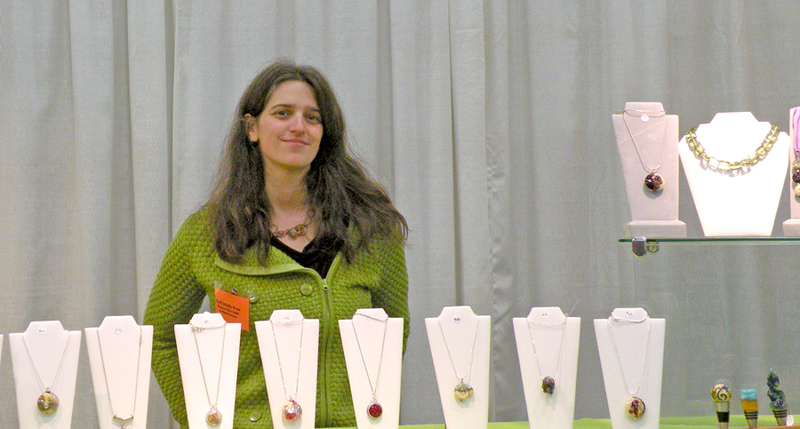 You can see pictures in this link from last year’s show. Knowing I’m about to miss a gorgeous long weekend, I decided to spend the afternoon in my garden. 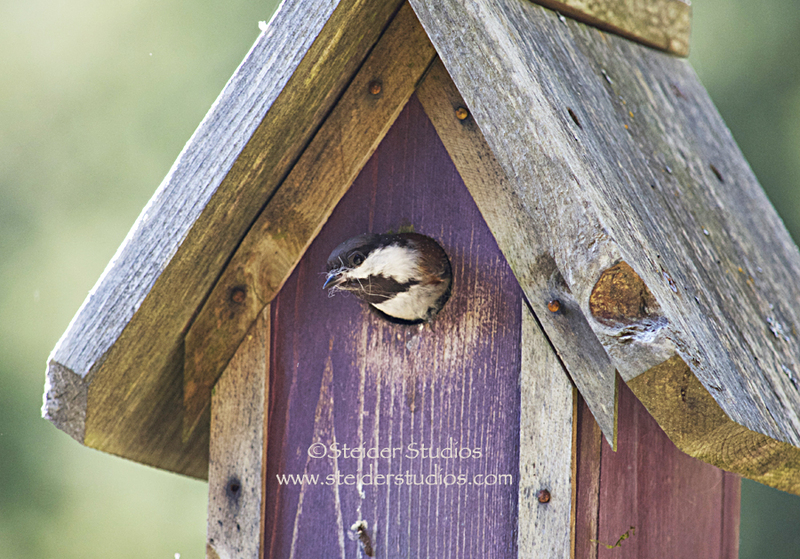 I noticed this little chickadee leaving a bird house so decided to wait & watch for a bit. He’s building a nest! 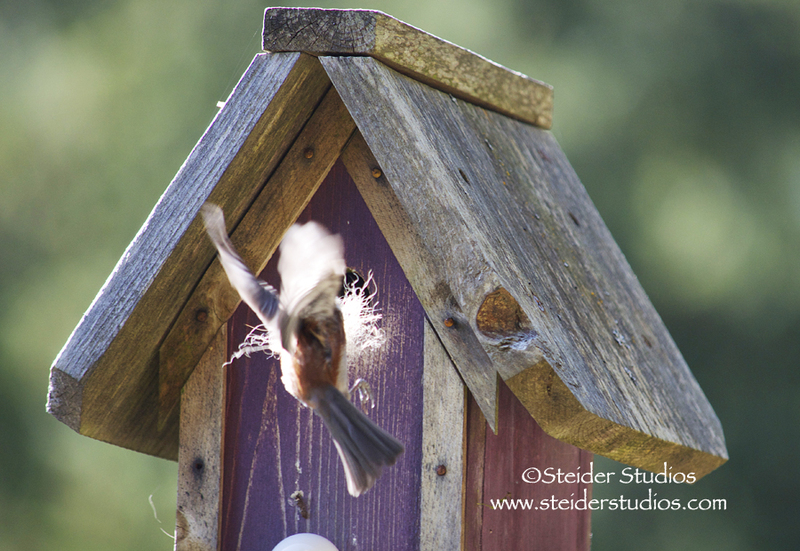 I love the sound of baby birds each spring. We have a swarm of hummingbirds defending territory. I’ve posted photos on my Facebook page, but will soon add them to An Artist’s Garden also. 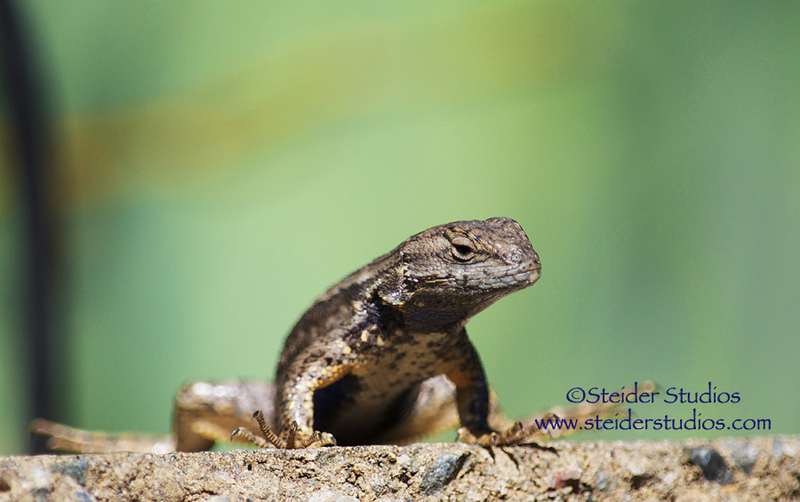 It was a lovely afternoon sharing the sun with this little guy, the birds, bees and butterflies! 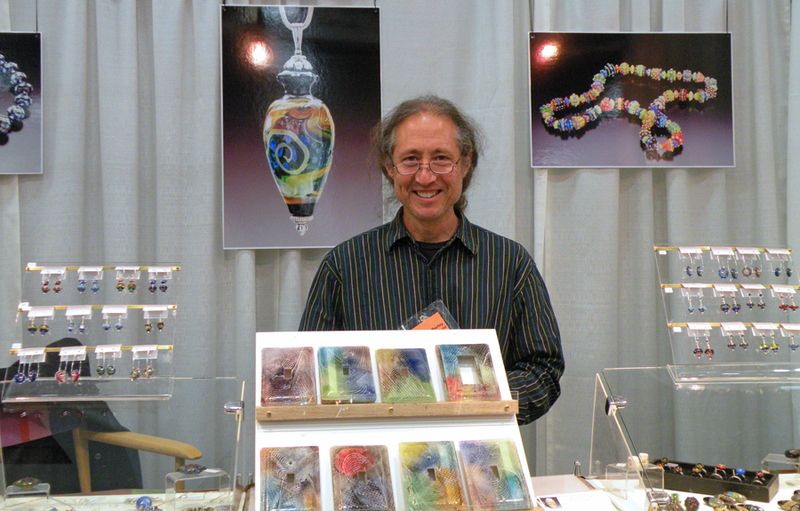 Hope to see you at Oregon Convention center for Gathering of the Guilds this weekend! 777 NE Martin Luther King Blvd in Portland Oregon. 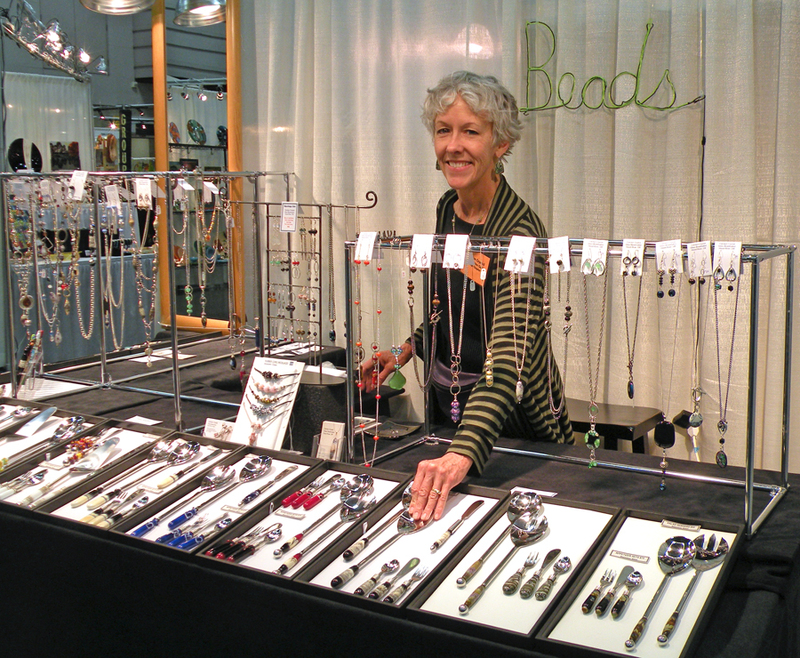 Hall C. Friday 10 – 9; Saturday 10 – 7; Sunday 10 – 5. 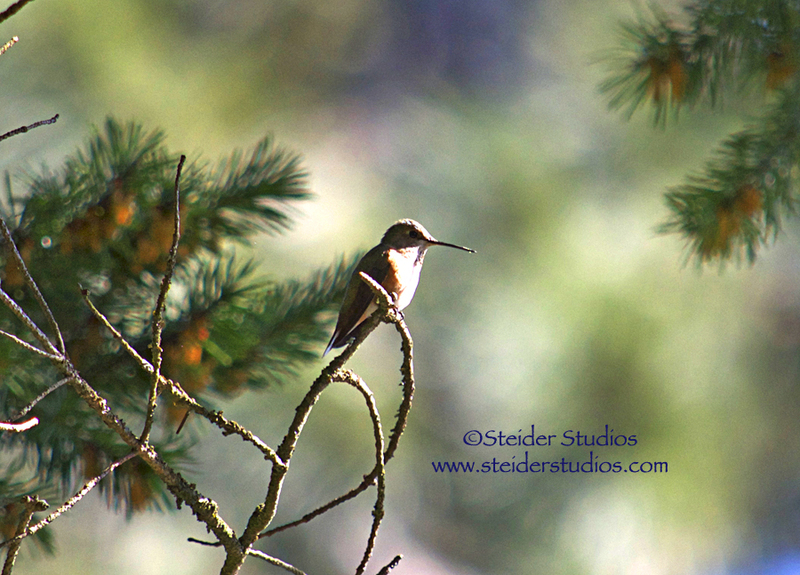 In case you didn’t know, you can see many of my photographs published as all occasion greeting cards in my Zibbet shop. Just click this link. 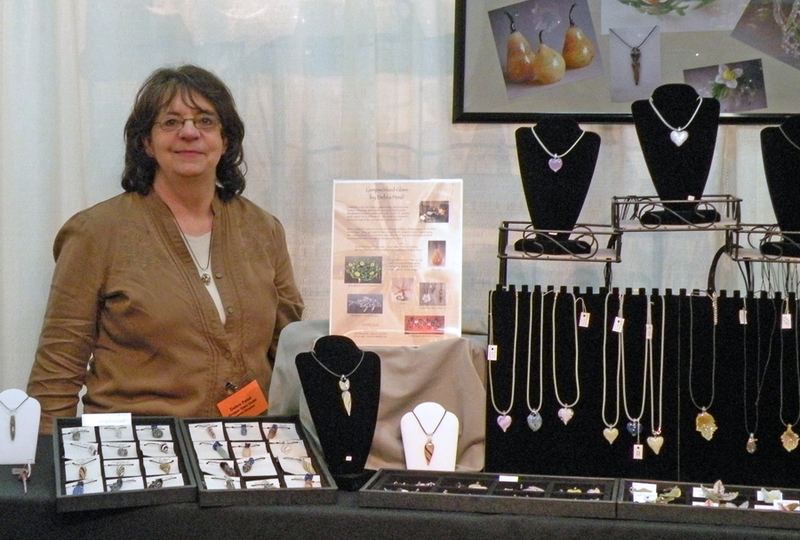 This spring, the Pacific Northwest Artfire Guild was discussing what to not forget when setting up a booth at an art fair or craft show. I said I would share my ‘do not forget list’ and thought I’d share it with you too. Rather than simply paste my list here, I want to explain my process. The ‘bones’ of my booth are my walls and tables so those are set up first. I use Pro Panels which are a bit spendy if you’re just starting out. I used peg boards at my first art festivals, that slid into a sturdy base my husband built for me. Some artists use metal grids and others hang items from their pop-up tents. My tables are inexpensive sturdy 2′ x 4′ that I found at Costco; and I use narrow plastic shelving units as extra ‘table space’, found at Home Depot. 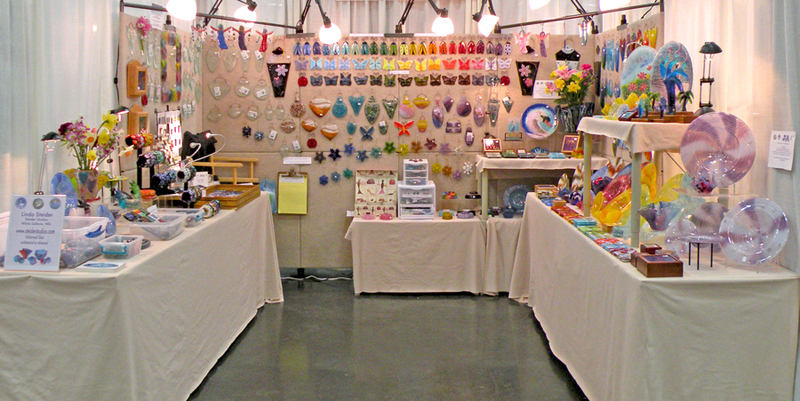 In my 10 x 10 booth, 4 tables nestle against two of my walls, and the lower narrower plastic shelves fit across half of one wall, leaving it more open for customers to easily see my wall pieces. This leaves a 2′ space for my director’s chair that I bought at Cost Plus. It’s in a corner near the jewelry so I can encourage folks to try on a bracelet or hold my earrings up to the light to see their sparkle. Because I only participate in shows that are indoors, lighting is very important. I bring 4 to 5 extension cords and two surge protector outlets. My wall lights slide into posts at the top of my booth and table lights are halogen lamps that I bought at Home Depot, plus gooseneck spotlights that I bought at Ikea. Once the wall lights are in place, plugged in and checked for burnt out bulbs, I dress the tables with coverings that are as close to the wall color that I could find. I like a neutral beige so that my work stands out and doesn’t fade into a background color. It is flame retardant fabric that I bought at a Portland fabric store. I think I originally bought 10 to 15 yards after measuring for 8′ tables plus 3′ on either side for draping then added a a bit more for ‘just in case’. Displaying my work is always a challenge because I want to put everything I have out. When I do that it looks like a jumbled mess, so I’ve finally learned to only put out what fits in the space. And trust me, it’s still a close fit! I place my newest or favorites out first in a rainbow of color or grouped in themes. My back up work is under the tables, hidden by table coverings; as are my empty storage boxes. When the show opens, I’m ready with bubble wrap and tissue paper, shopping bags, receipt books, pens, a calculator, my mailing list sign up sheet, business cards, postcards of my work, any other printed material about me and my work, enough change to get through the end of the show, and my square for credit card purchases. By the way, if you’re an artist and still using the old card processors you’re spending more money than you have to with all their fees. Do yourself a favor and get the square for your smart phone to process credit cards. Oh, and the MOST important part? Smile! When you smile, you’re inviting the customer into your booth. If you’re having a bad day, smile anyway. Smile even if your sales are not strong. 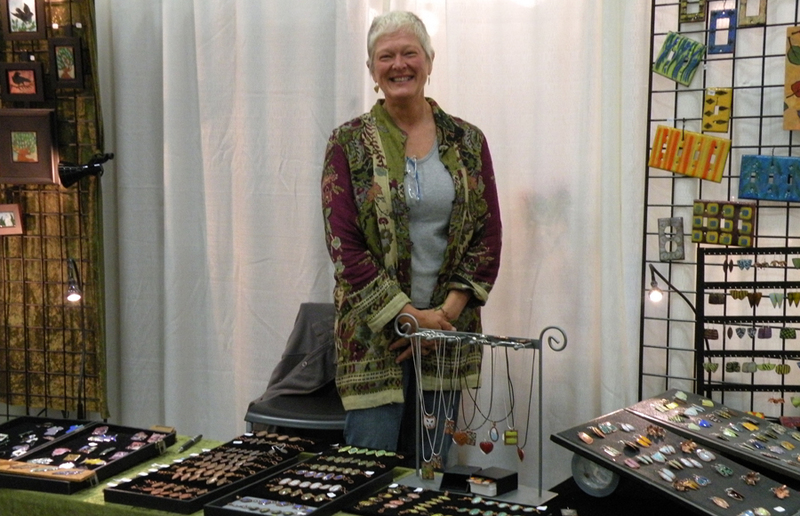 Even on my worst sale days, I’ve met and talked with interesting people perusing the show; made friends with my booth neighbors; added names to my mailing list; and picked up a new gift shop here and there to wholesale my work. When the show is busy and crowds are throwing money around it’s a blast. You can’t help but laugh and have fun all day. If it’s slow, no need to stand around and pout, I take inventory of what I’m running low on or what color is missing from my display. I clean fingerprints off my glass and straighten or refresh my display. If those tasks are done and it’s still slow, I start sketching and designing new ideas. Whatever you do, DO NOT READ A BOOK! Should that one customer walk by who is actually looking to purchase something, you’ve closed them off from your booth. They perceive you as not caring about being there since you’d rather be reading. Put your work into the hands of that prospective buyer. When someone holds your art, or tries on your jewelry, you’re closer to wrapping it up for them. Don’t be afraid to ask for the sale. If the piece they like is beyond their budget, maybe you have a similar piece that’s smaller, or not as detailed that will fit their budget. Or perhaps you can work out a layaway plan. Talk with those interested in your work, they want to know all about you; and if you are willing to ask questions and get to know them, you may be building a lasting relationship and future sales. When you make the sale and wrap up the purchase, include your business card, any promotional materials you have about your work and be sure to put your new customer on your mailing list. With their permission, of course! 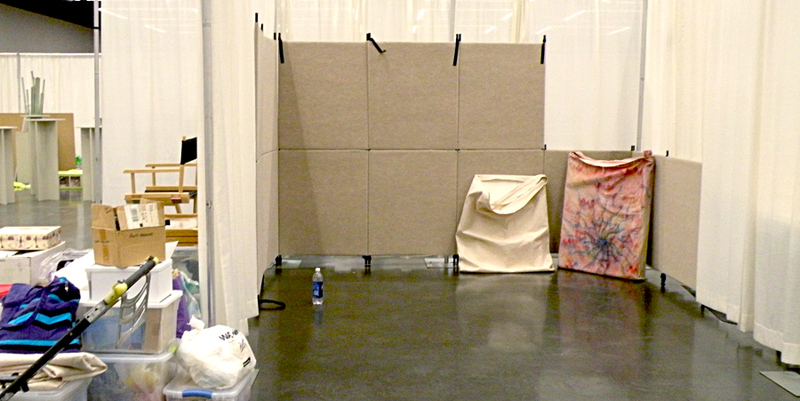 Lastly, when the show is over, and you’re packing up, be courteous to your booth neighbors. Don’t stack your packed up booth components in the center of the aisle so that no one may pass. Don’t knock into your neighbors walls. It’s not a race. Everyone is tired and wants to go home. 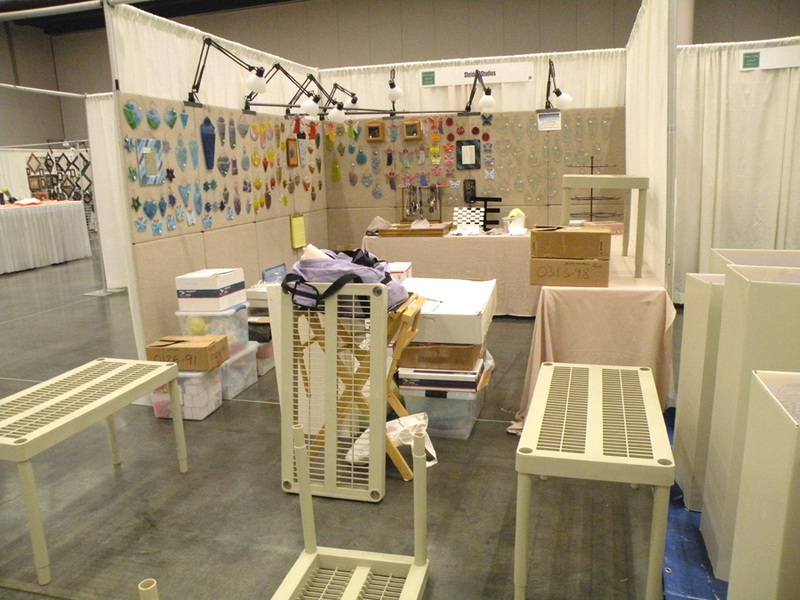 Booth: pro panels, support bars, connectors, curtain hooks, t-pins, director’s chair, fireproof info, flowers, hammer, nails, screwdrivers phillips & regular, jewelry display, step-ladder, shims, lights, extra bulbs, extension cords, power strip, signage, display stands & risers, table coverings and night covers, safety pins, measuring tape, tables, duct tape, carpet, travel vacuum cleaner, zip ties, cleaning cloth, my work and a hand truck to move it all into my booth space. Literature: business cards, brochures, postcards, teaching/show schedules, mailing list sign up sheet. Conducting Business: change, receipt book, pens, calculator, square, phone, stylus, charger, glasses, bags, gift boxes, wrapping paper, bubble wrap, scissors, paper punch, laptop, name tag, price tags, tape, tax id in WA. For quick custom jewelry: ear wires, jewelry pliers, leather cord & scissors, tweezers. Extras: camera, water, snacks, lunch, lozenges, chocolate for guests, sketchpad. I’d love to know what you take that isn’t on my list, or what you do differently! Please share in the comments section below!! My last show of the season is now history. I didn’t have much time to document, but I love this venue and want to share what I have. 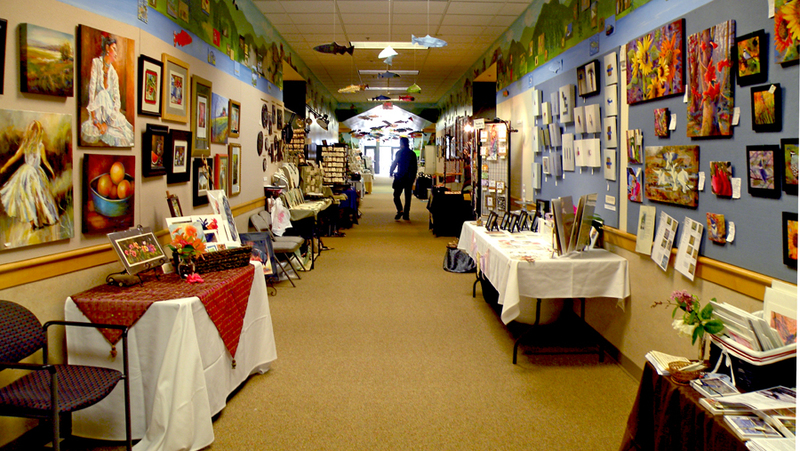 The Columbia Gorge Art Festival is a fundraiser for the Corbett Education Foundation which provides scholarships to Corbett students. Before the doors open, it’s quiet enough to grab a few shots. 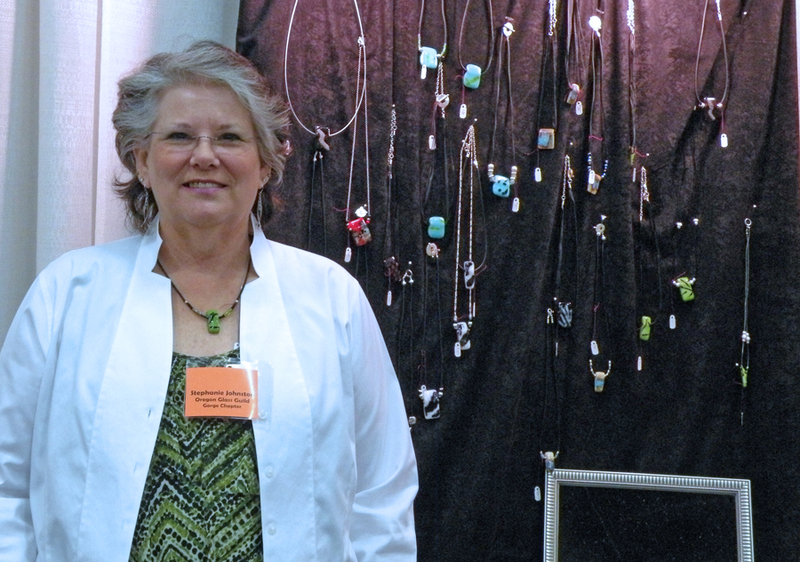 Pam is the marvelous show coordinator and runs the event with a cool head and impeccable business skills. She is fabulous to work with and we all adore her. 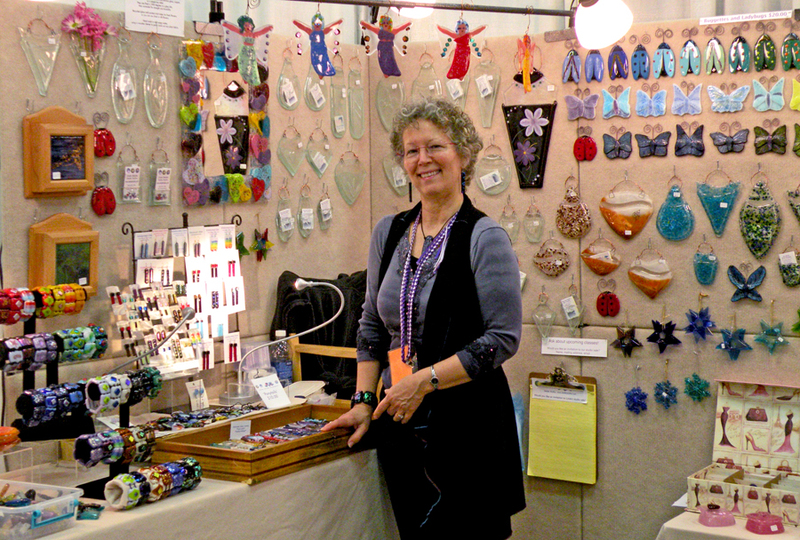 My east neighbor for the weekend was Tacy Jones of Eagle Creek Rock Jewelry and felted bags. 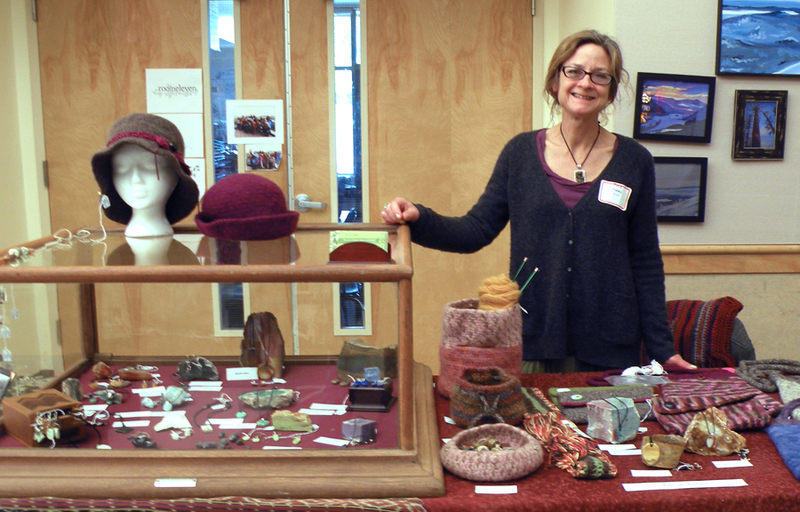 Her rocks, jewelry and felted bags & hats are beautiful. My west neighbor was Laurie Miller who has been my neighbor at this venue for many years. She has some very cool garden signs (one of which I purchased) that I loved so much, I commissioned her to make several (ok, a dozen) more for me. I didn’t get a picture of her booth, so lifted this image from her blog. 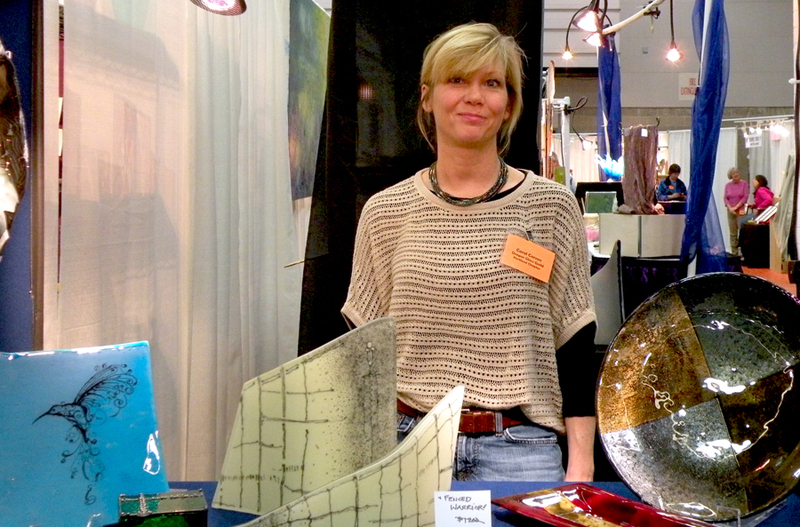 Had a great time connecting with other artists, visiting with volunteers and schmoozing with patrons. Next stop, replenishing my galleries; then preparing to teach at Half Moon Creek LLC in Palmer Alaska (where my class is full!!) 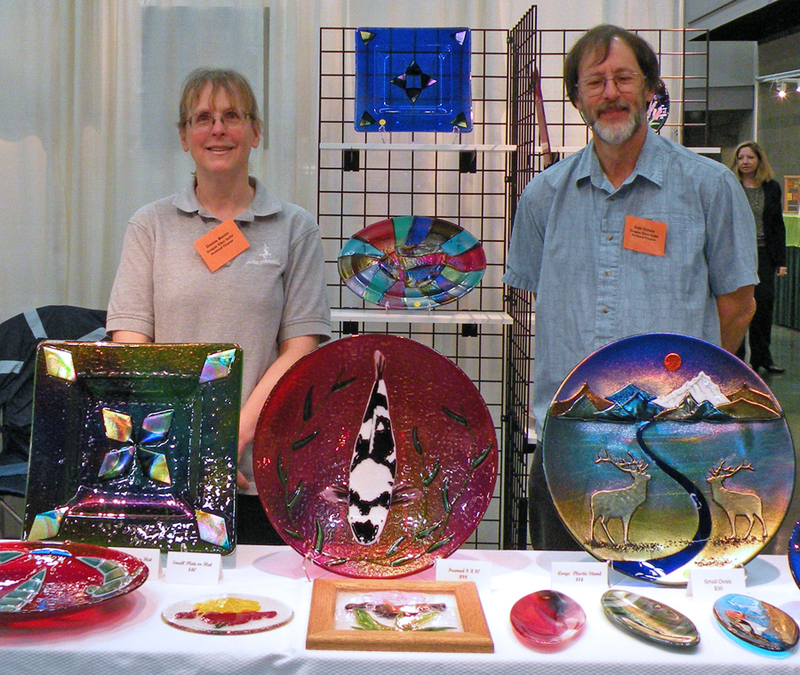 and Pacific Art Glass in L.A. CA. If you’re near LA I believe there are still spots open & I’d love to see you! I’m feeling particularly exhausted after this year’s Glass Gallery. The last two days were spent basking in the sun photographing birds and flowers in my garden as new colors emerge from the earth. Today is back to reality with two more shows coming right up! 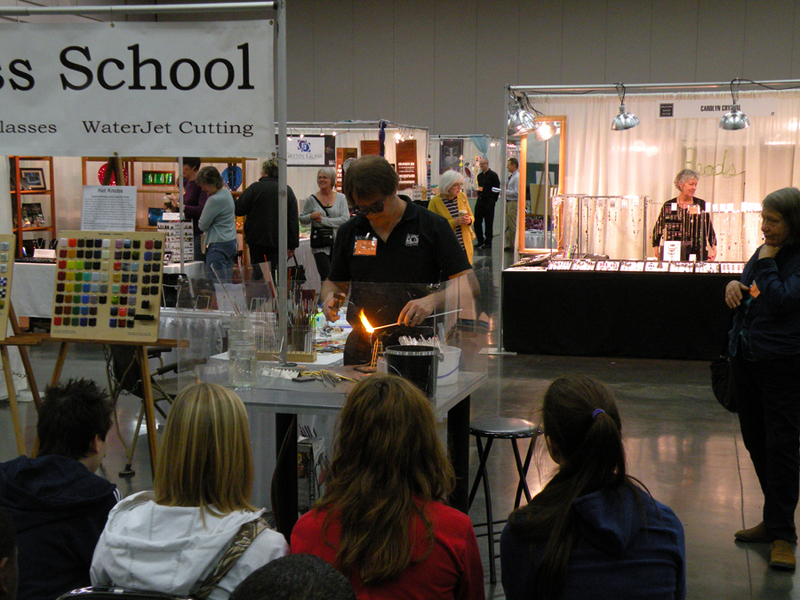 Don Bietschek of Aquila Glass School demonstrating. 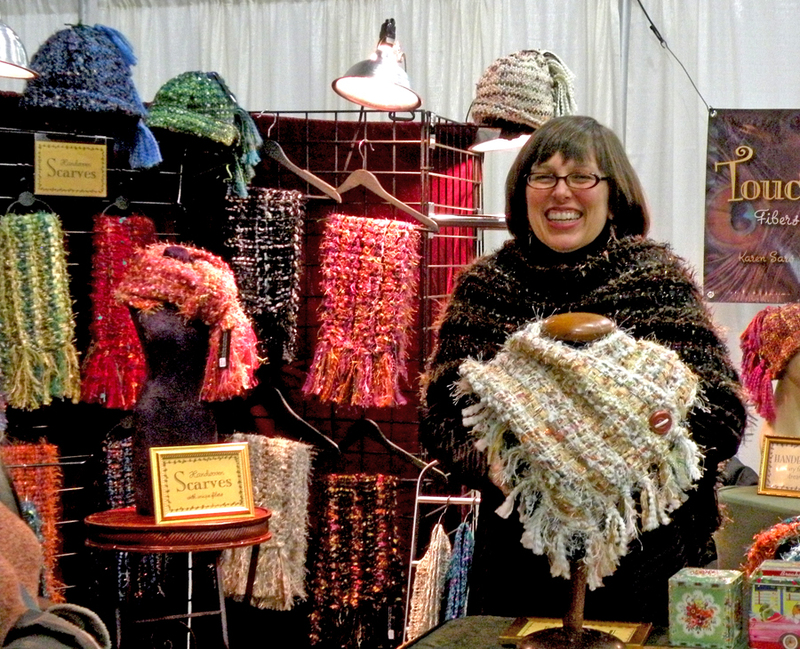 And just to show you I DID get out of my guild area for a couple of minutes, here is my friend, Karen Saró Troeger of Touch the Sky in the Handweavers Guild having just as much fun as I did! It’s always a treat to meet new art collectors and network with old friends at this show, probably the largest one that I participate in. Over the three days I was privileged to have several particularly poignant conversations. Some of which I cannot let go of … that I keep thinking about … and am grateful … honored that I was chosen to have those stories shared with me. 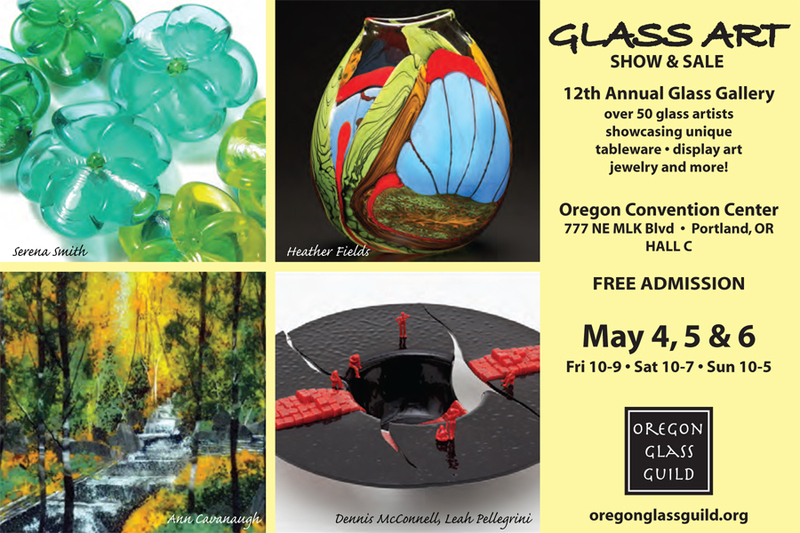 One week from today is the opening of Oregon Glass Guild’s 12th Annual Glass Gallery at Gathering of the Guilds in Portland Oregon. It’s a fabulous three day art show and it’s what to do in Portland next weekend. 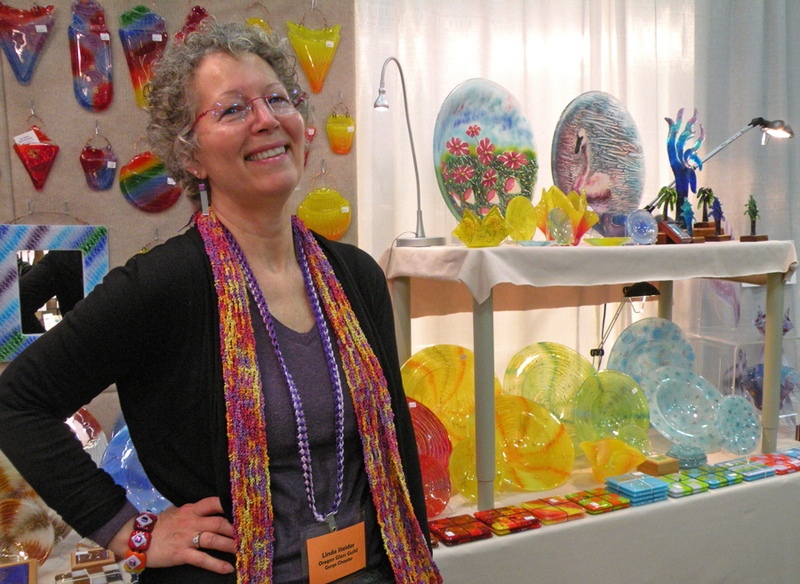 Glass Gallery is held in conjunction with Gathering of the Guilds, which is the largest artist-owned art show on the West Coast. The show runs May 4, 5, and 6. Show hours are 10am – 9pm on Friday; 10am – 7pm on Saturday; and 10am – 5pm on Sunday. 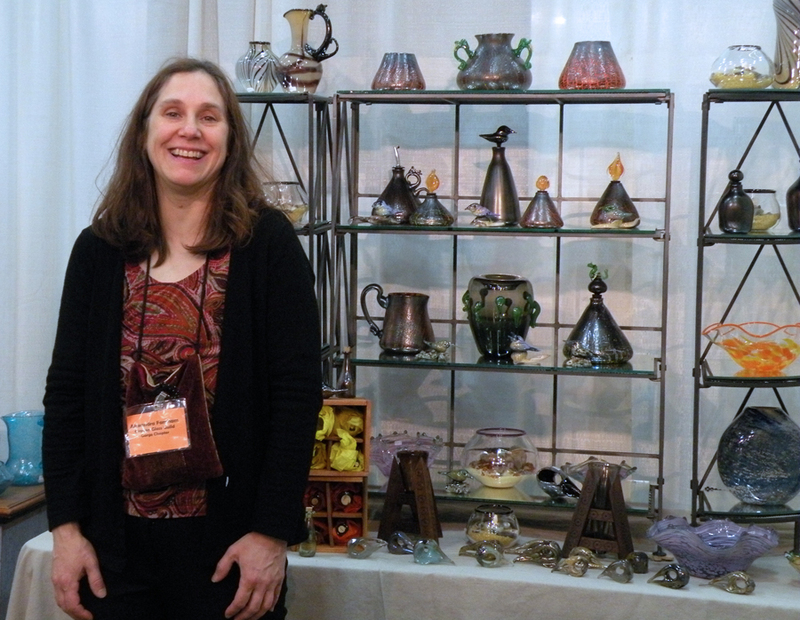 Originally started by the Oregon Potters Association thirty years ago, ‘Gathering of the Guilds’ includes the Oregon Glass Guild, Portland Handweavers Guild, Portland Bead Society, Guild of Oregon Woodworkers, Creative Metal Arts Guild and Northwest Fine Woodworkers. The Oregon Convention Center is located at 777 NE MLK Blvd in Portland close to the intersection of I84 and I5. 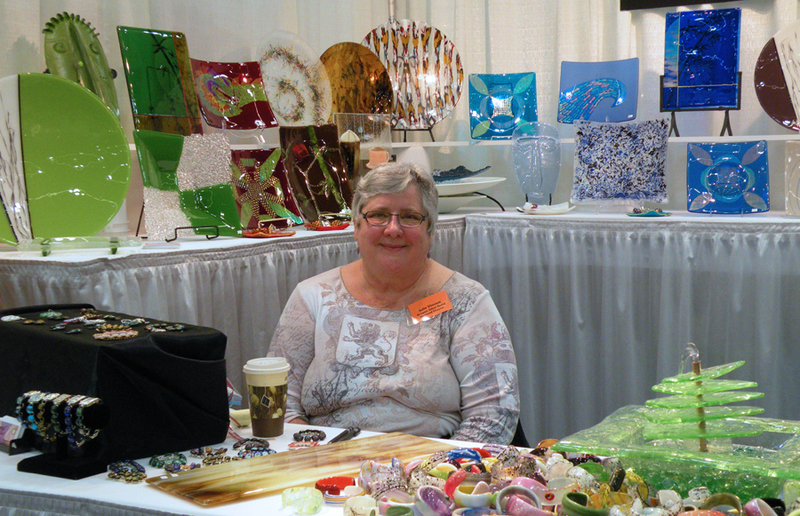 You’ll find the Glass Gallery in Hall C.
The best way to see the show, meet artists and learn a bit more about their work is during the typical ‘slow’ times of an art show. Friday during the day, Saturday night and Sunday morning. Typically the largest crowds arrive Friday night after work and Saturday late morning through late afternoon; then Sunday early afternoon after church and brunch. If you go during a slower time, you can get to know your favorite artist better – ask about their work, what inspires them, what upcoming projects they have, and maybe even talk about a special commission you’d like them to make for you. 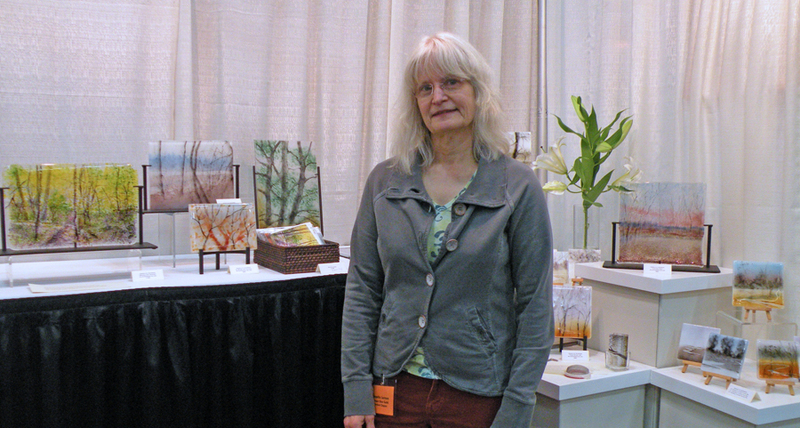 You can read about how I set up my booth in this post from last year’s show: Epilogue of the Event: Glass Gallery 2011. 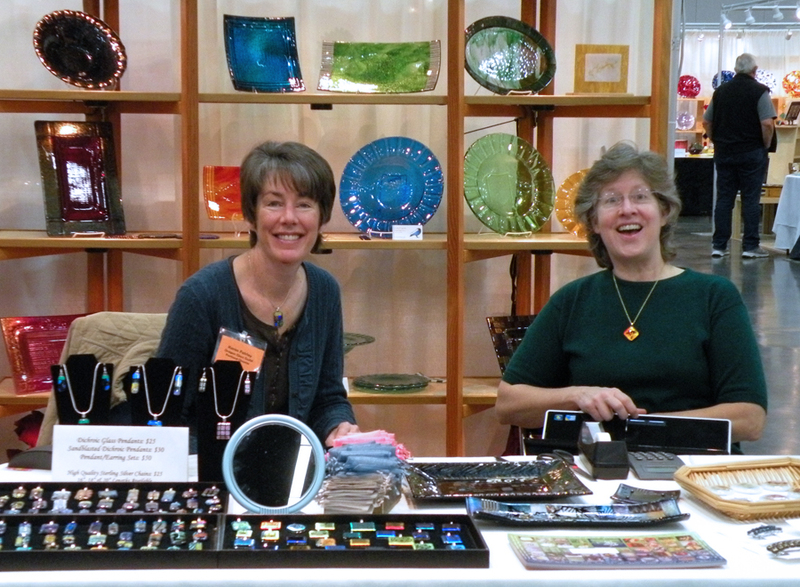 This year I’ll be in booth # 29, nestled between my friends, Carolyn Crystal and Kathy Watne behind the information booth. We plan to have a lot of fun. Come see us first, ok?!! Oh, and I’d love it if you tell me you follow my blog! !